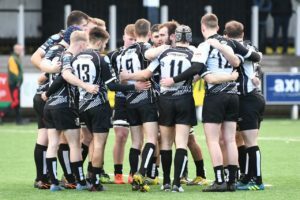 Pontypridd Youth played host to Merthyr in the third round of the Blues Premiership on Saturday 15th September, hoping to build on their successful start to the new season. A hard physical encounter was anticipated and the spectators were not disappointed. The opening quarter saw both teams play with pace, taking the ball up when needed and going wide as the opportunities arose. The dominating factor however in the early exchanges was the defensive effort that both teams put in. It was from a penalty and the resulting lineout drive that Ponty got the ball over the line to take the initial lead. Just five minutes later the home team registered another well worked try but then as the first half drew to a close had to withstand concerted pressure from Merthyr to protect their ten point advantage into the interval. The second half saw Merthyr start where they had finished off the first, being more direct in their play and forcing the Ponty scramble defence to deny a try scoring opportunity. As the half progressed a Merthyr defensive error allowed the ball to spill lose only to snapped up by the Ponty back line who crossed for a converted try. Merthyr now looked a little rattled and quickly conceded another try. The final quarter of the game saw the visitors re-double their efforts to get onto the score board but a resolute Ponty defence holding them a bay to register a valuable 22pts to 0 victory. Try scorers for Pontypridd were Cameron Macmillan, Josh Mortinson, Ioan Evans and Aneurin Jones with scrum half Lloyd Dennet adding a solitary conversion.